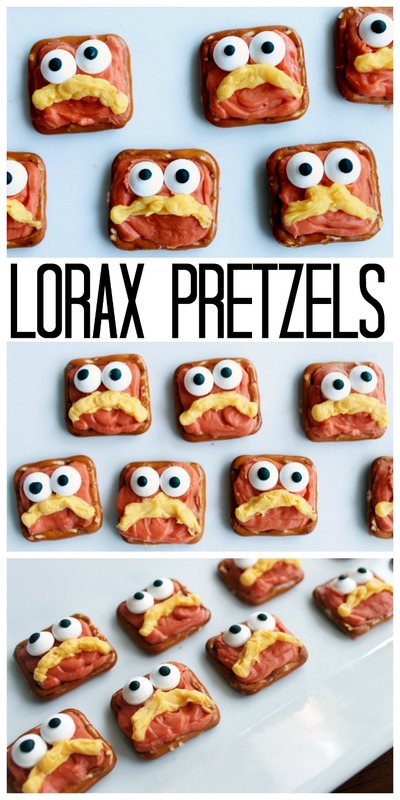 I love celebrating the birthday of Dr. Seuss with my kids and this year we will be making these cute Lorax pretzels. You can find the recipe below for these quick and easy pretzels that are perfect for enjoying at home or sending to school. 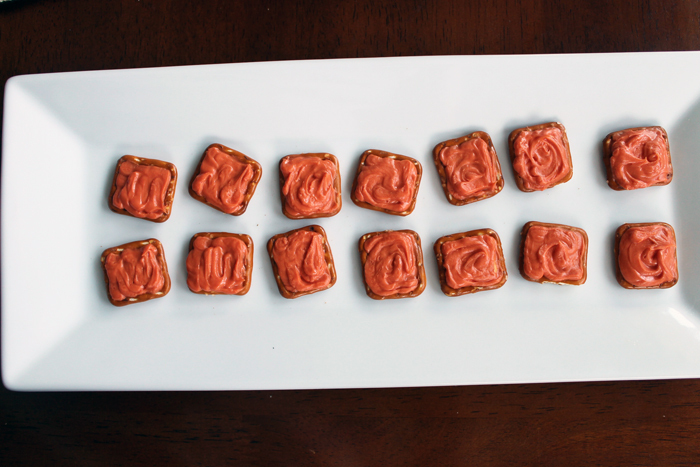 Most school celebrate Read Across America Day and these pretzels are the perfect treat for the party. A quick and easy treat idea that Dr. Seuss himself would love. Melt the orange candy melts according to the package directions. Melt the yellow candy melts as well. Add both to zip topped plastic bags and trim one corner of each with a pair of scissors. Squeeze the orange to apply to the top of the pretzels. Squeeze the yellow to apply a mustache like shape to the top. Press in two candy eyes to the candy coating that is still wet. 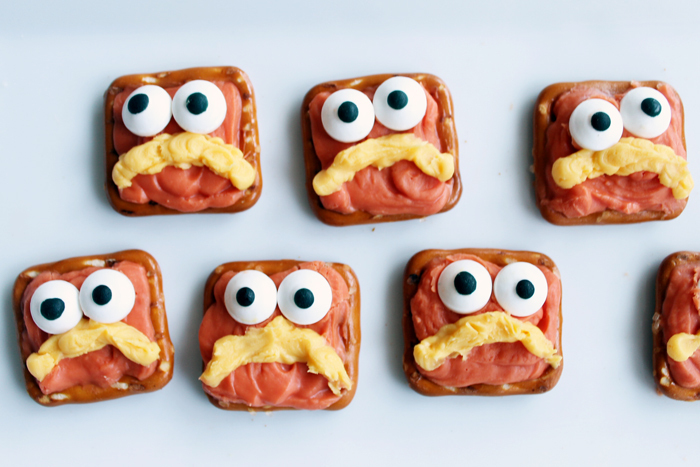 Continue until you have all of the Lorax pretzels that you need to celebrate Dr. Seuss. Candy melts cure quickly so you may want to make these in small batches. I actually only had red and yellow candy melts so I mixed my own orange. That is totally okay too! Use what you have on hand and make your kids some fun treats. 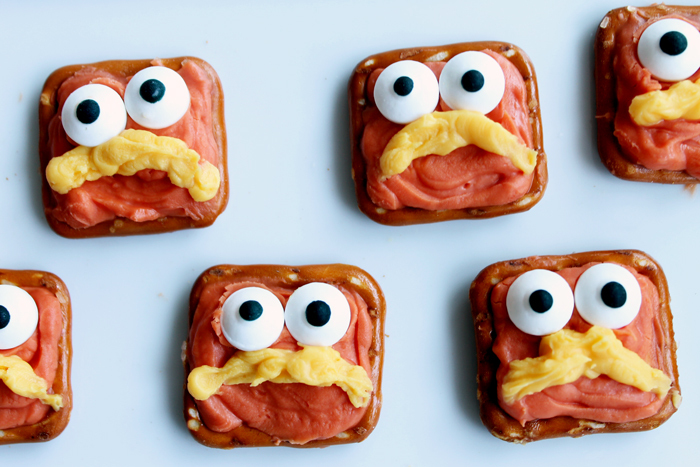 These Lorax pretzels are actually really, really good and a quick and easy recipe. This sounds like the perfect away to make a party snack to me! 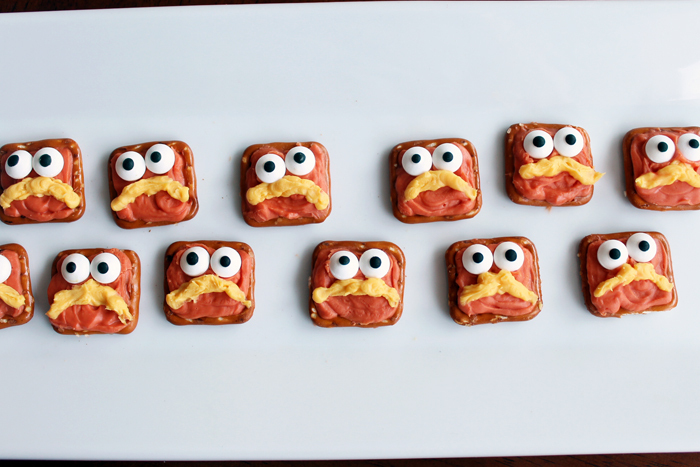 Add these fun Lorax pretzels to your must make list for any Dr. Seuss party that you are planning or that the school is hosting. Everyone will love these quick and easy treats. Need more ideas for Dr. Seuss? Try these 50 Dr. Seuss fun food and craft ideas. Melt the orange candy melts according to the package directions. Melt the yellow candy melts as well. Add both to zip topped plastic bags and trim one corner of each with a pair of scissors. Squeeze the orange to apply to the top of the pretzels. Squeeze the yellow to apply a mustache like shape to the top. Press in two candy eyes to the candy coating that is still wet. Candy melts cure quickly so you may want to make these in small batches. What a great idea – love these! Oh My Gosh! These are so very cute. I bet they are yummy too! Thanks for sharing them at the This Is How We Roll Link Party! 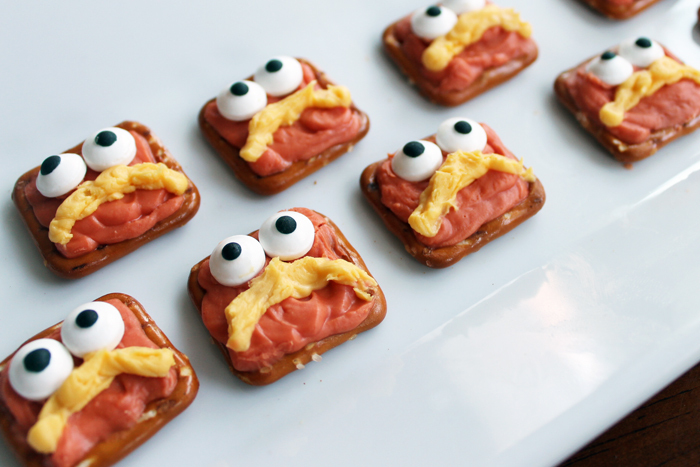 These are the most adorable pretzels, a great snack! Hope you have a fantastic weekend and thanks so much for sharing your awesome post with us at Full Plate Thursday! Awe! That is so cute and clever! Who doesn’t love a good Dr. Seuss depiction? These are too cute Love that movie! Sharing on Twitter. Thanks for linking up at #MerryMonday! These are too cute! We love The Lorax. Featuring this week at Funtastic Friday! These are really too cute for words. The kids will gobble them right up.